Not only for tourists, but also for Berliners a hot tip from Kreuzberg – the BIG SUR restaurant! I was invited to a truly fantastic evening of many good dishes. Since 2016 the restaurant BIG SUR can be found in the Graefen District. The owner, Marvin, is no stranger to the street food scene in Berlin. With his burgers from his Gorilla Barbecue Foodtruck, he treated quite a few savourers and was also awarded a few prices for them. In the BIG SUR restaurant, he is now realising his dream of innovative, fresh and seasonal cuisine. It all centres around dishes from California. But those who think “yeah – a new burger place in Berlin!” are in the wrong. There are some burgers on the menu, but the Californian cuisine is so much more. The owner, Marvin, wants to prove that there are seasonal foods other than burgers and chips. 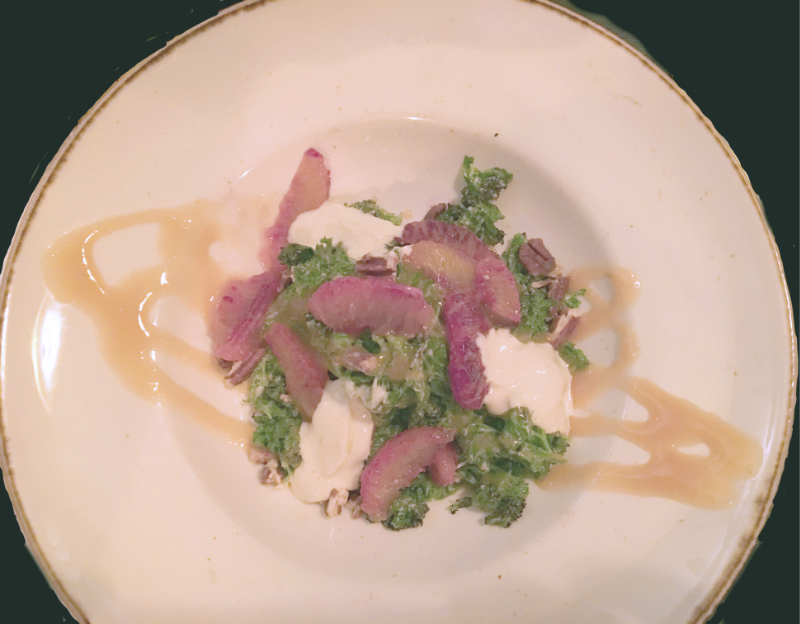 On his summer menu, for example, are fresh wild herbs as opposed to the kale dishes from the winter menu. Grilled pork belly, deep fried buttermilk chicken and tacos are available. When I visited, they had a mouth-watering pumpkin pie on the menu that I couldn’t resist. When I got to test the restaurant it was the week of the Minnesota Juicy Lucy (blue cheese stuffed beef patty, sauteed mushrooms, balsamic glazed onions, sour apple, fig sauce). I don’t want to get anyone jealous, but the burger was fantastic. The different tastes were in great harmony, the patty was perfectly cooked, and the bun was really fresh. I am curious to see which of the states is going to be represented next. The drinks menu had quite a few items that are worth a try. From New Dehli Sour (Bullet Rye Whiskey, Lemon, Cardamom, Belsazar Red Vermouth, Aquafaba) to Hot Port (Tawny-Port, Heering Cherry, Chocolate Bitters, Orange Blossom) there are no wishes left unfulfilled. For those who prefer the classics, there is a great selection of wines, beers and soft drink available and the bartender also mixes special requests of the guests. On Sundays the BIG SUR offers a Californian Bruch, starting from 11 in the morning. 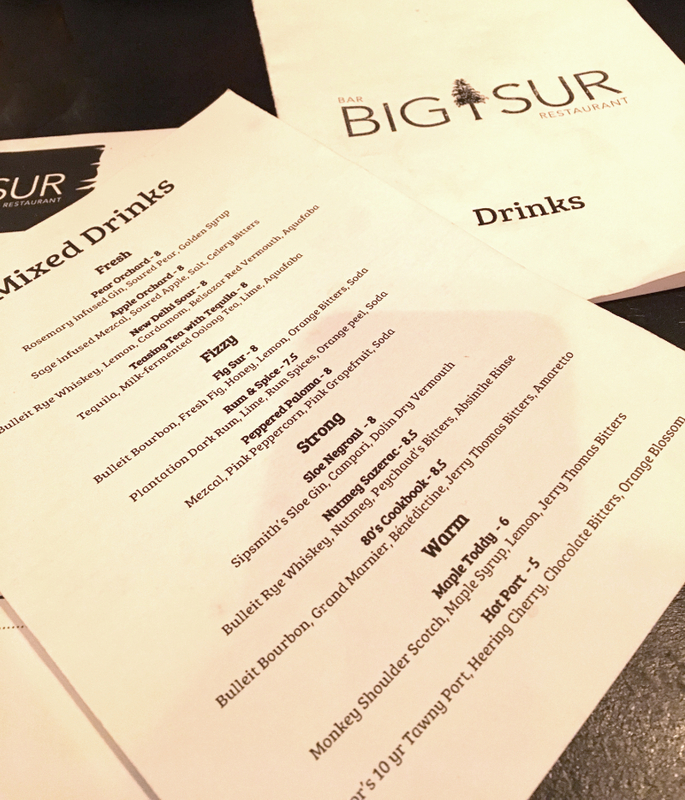 My visit to the BIG SUR was part of a sponsorship and my food and drinks were free. This blog post reflects my personal opinion.